Software Used Images Plus 4.0 for camera control, calibration, stacking, digital development, multiresolution sharpening, smoothing and noise reduction. Photoshop CS5 used for levels and curves, color correction, selective color, high pass filter, star shrinking, lab color, saturation adjustments, screen mask invert, and lens correction. Gradient Xterminator for gradient removal. Carboni Tools for additional saturation adjustments, noise reduction, and smoothing. HLVG for additional color correction. Notes I originally was pretty unsatisfied with this image. 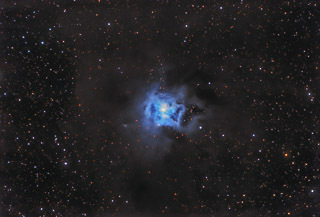 However, I eventually reprocessed it and was able to pull out some better colors and nebulosity. Still, I don't think I have the best data, so I plan on reimaging this object someday.